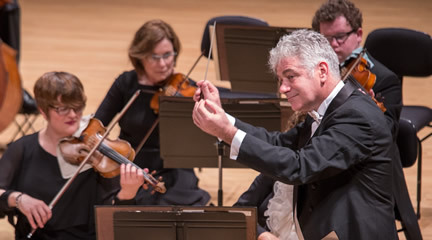 North Carolina Symphony audiences in Southern Pines and New Bern can look forward to Music Director Grant Llewellyn's first appearances in those communities this season. Llewellyn is thrilled to return to Southern Pines on January 31 at 8pm at Pinecrest High School and to New Bern on February 5 at 7:30pm at Temple Church. NCS also performs a one-hour version of this program on the Friday Favorites series in Raleigh on February 1 at noon at Meymandi Concert Hall. Llewellyn is especially eager to lead a program that has a great amount of personal significance for him. He explains that as a former cellist (in fact, he still plays the cello "enthusiastically, but very much at home"), the opportunity to conduct a program for string orchestra is a "self-indulgence." Llewellyn has fond memories of performing most of the works on this program, like Tchaikovsky's Serenade for Strings, in his student days. As one of Tchaikovsky's warmest, most heartfelt creations, the Serenade for Strings received an enthusiastic reception when it was first premiered in 1881 and has been a favorite ever since, for seasoned classical music lovers and novices alike. Tchaikovsky wrote that "This is a piece from the heart." Its sunny character mingles with moments of soaring, achingly beautiful melodies, and the elegance and delicacy of the serenade make it unmistakable that this is Tchaikovsky's homage to Mozart. "It's Tchaikovsky at his melodious best – he couldn't help but write incredible melodies," asserts Llewellyn. "This is a piece that every string player just loves to get their teeth into." Grieg and Respighi also looked to the past for their works on this program. With his beloved "Holberg" Suite, Grieg celebrated the bicentennial of the famous Norwegian playwright Ludvig Holberg by turning to the Baroque musical forms that would have been popular in Holberg's time. Respighi's Ancient Airs and Dances is based on Italian and French lute music from the early 17th century. As a master of orchestral color, Respighi evokes the unique sonority of a lute – a guitar-like instrument – using the forces of the string orchestra. "Respighi takes advantage of all the possibilities of what a string orchestra can do in order to capture the essence of these ancient dance forms," Llewellyn says. New York-based composer Jessica Meyer also explores the unique sonic capabilities and resonances of string instruments in Through Which We Flow. Inspired by a book that explores a spiritual extension of string theory and quantum mechanics, Meyer creates a soundscape that journeys through various emotional states – as Llewellyn describes it, constantly "evolving and flowing and changing." Regardless of the listener's understanding of the parallel that Meyer draws between metaphysics and music, the work is easily appreciated for its beauty alone. "Jessica Meyer's Through Which we Flow is really evocative and beautiful, and calls for sounds and techniques we don't always get to use," says Principal Cello Bonnie Thron. "I am always excited to discover new works; the exploration into those new sounds makes the standard repertoire sound fresh to my ears as well!" From the heart-on-your-sleeve honesty of Tchaikovsky to Jessica Meyer's translation of string theory into deeply emotional art, this all-strings program truly pulls at the heart strings. The Southern Pines performance includes a pre-concert talk offering additional background on the music, at 7pm in the Pinecrest High School Band Room; the Raleigh performance includes a pre-concert talk at 11am at Meymandi Concert Hall. Tchaikovsky: Serenade for Strings will be performed on the one-hour Raleigh program.